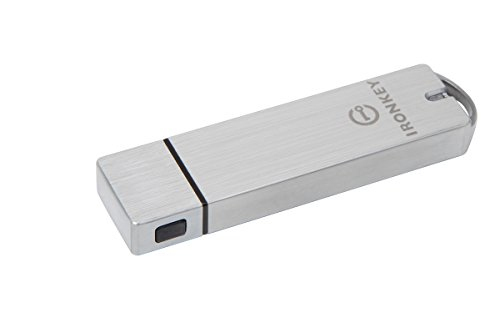 Kingston’s IronKey™ S1000 meets the strictest standards to make it the ultimate security drive. Safeguard 100 percent of confidential data with 256-bit AES hardware-based encryption, in XTS mode, and FIPS 140-2 Level 3 validation with on-device Cryptochip Encryption Key management. The drive detects and responds to physical tampering and provides automatic data protection upon drive removal. For added peace of mind, the drive uses digitally-signed firmware making it immune to BadUSB. The drive locks down after ten invalid password attempts and there is also the option to reformat or destroy the drive. Available in 4GB to 128GB1 capacities, the S1000 basic model provides fast USB 3.02 performance and enhanced, hardware-based security without compromise. Meeting the most stringent standards for military grade strength and durability, the drive is built with an anodized aluminum enclosure and epoxy-filled casing. Dust- and shock-resistant, the S1000 is waterproof to MIL-STD-810F standards. In addition to the basic model qualities, the S1000 enterprise version offers central administration of drive access and usage across thousands of IronKey enterprise drives with the intuitive, easy to use, secure online interface3. Using an activated license and available IronKey EMS by DataLocker, the drive works with either cloud-based or on-premises servers to remotely enforce password and access policies; allow users to recover lost passwords; and even let administrators repurpose drives no longer in use.